Chorizo (/tʃəˈriːzoʊ, -soʊ/, from Spanish [tʃoˈɾiθo]) or chouriço (from Portuguese [ʃo(w)ˈɾisu]) is a type of pork sausage. Traditionally, it uses natural casings made from intestines, a method used since Roman times. In Europe, chorizo is a fermented, cured, smoked sausage, which may be sliced and eaten without cooking, or added as an ingredient to add flavor to other dishes. Elsewhere, some sausages sold as chorizo may not be fermented and cured, and require cooking before eating. Spanish chorizo and Portuguese chouriço get their distinctive smokiness and deep red color from dried, smoked, red peppers (pimentón/pimentão). The etymology of chorizo is uncertain: it was formerly thought to derive from the Latin salsicium, meaning "salted". In English, chorizo is usually pronounced /tʃəˈriːzoʊ, -soʊ/. Non-English pronunciations are sometimes heard, including /tʃəˈriːθoʊ/, mimicking Castilian Spanish pronunciation. Spanish chorizo is made from coarsely chopped pork and pork fat, seasoned with garlic, pimentón – a smoked paprika – and salt. It is generally classed as either picante (spicy) or dulce (sweet), depending upon the type of pimentón used. Hundreds of regional varieties of Spanish chorizo, both smoked and unsmoked, may contain herbs, and other ingredients. For example, chorizo de Pamplona is a thicker sausage with the meat more finely ground. Among the varieties is chorizo Riojano from the La Rioja region, which has PGI protection within the EU. Chorizo is made in short or long and hard or soft varieties; leaner varieties are suited to being eaten at room temperature as an appetizer or tapas, whereas the fattier versions are generally used for cooking. A rule of thumb is that long, thin chorizos are sweet, and short chorizos are spicy, although this is not always the case. Spain produces many other pork specialties, as well, such as lomo embuchado or salchichón, cured and air-dried in a similar way. Lomo is a lean, cured meat to slice, made from the loin of the pig, which is marinated and then air-dried. Salchichón is another cured sausage without the pimentón seasoning of chorizo, but flavoured with black peppercorns, instead. Depending on the variety, chorizo can be eaten sliced without further cooking, sometimes sliced in a sandwich, or grilled, fried, or baked alongside other foodstuffs, and is also an ingredient in several dishes where it accompanies beans, such as fabada or cocido montañés. The version of these dishes con todos los sacramentos (with all the trimmings, literally sacraments) adds to chorizo other preserved meats such as tocino (cured bacon) and morcilla (blood sausage). Portuguese chouriço is made (at least) with pork, fat, wine, paprika, garlic, and salt. It is then stuffed into natural or artificial casings and slowly dried over smoke. The many different varieties differ in color, shape, seasoning, and taste. Many dishes of Portuguese cuisine and Brazilian cuisine make use of chouriço – cozido à portuguesa and feijoada are just two of them. A popular way to prepare chouriço is partially sliced and flame-cooked over alcohol at the table (chouriço à bombeiro). Special glazed earthenware dishes with a lattice top are used for this purpose. In the heavily Portuguese counties in Rhode Island and southeastern Massachusetts, chouriço is often served with little neck clams and white beans. Chouriço sandwiches on grinder rolls, with sautéed green peppers and onions, are commonly available at local delis and convenience stores. Stuffed quahogs (also known as stuffies), a Rhode Island specialty, usually include chouriço. 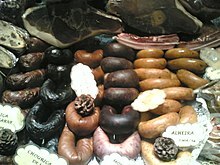 In Portugal, a blood chouriço (chouriço de sangue) similar to black pudding is made, amongst many other types of enchidos, such as alheira, linguiça, morcela, farinheira, chouriço de vinho, chouriço de ossos, chourição, cacholeira, paia, paio, paiola, paiote, and tripa enfarinhada. Based on the uncooked Spanish chorizo fresco (fresh chorizo), the Mexican versions of chorizo are made not just from fatty pork, but beef, venison, chicken, turkey, and even tofu, kosher, and vegan versions are made. The meat is usually ground (minced) rather than chopped, and different seasonings are used. This type is better known in Mexico and other parts of the Americas, including the border areas of the United States, and is not frequently found in Europe. It is typically spicier than Spanish and Portuguese varieties of the sausage, and often contains chili peppers that are higher on the Scoville scale. Chorizo and longaniza are not considered the same thing in Mexico. Due to culinary tradition and the high cost of imported Spanish smoked paprika, Mexican chorizo is usually made with native chili peppers of the same Capsicum annuum species. Spanish-American cuisine adds vinegar instead of the white wine usually used in Spain. Chorizo verde (green chorizo) is an emblematic food item of the Valle de Toluca, and is claimed to have originated in the town of Texcalyacac. The area of around Toluca, known as the capital of chorizo outside of the Iberian Peninsula, specializes in "green" chorizo, made with some combination of tomatillo, cilantro, chili peppers, and garlic. The green chorizo recipe is native to Toluca. Most Mexican chorizo is a deep reddish color, and is largely available in two varieties, fresh and dried, though fresh is much more common. Quality chorizo consists of good cuts of pork stuffed in natural casings, while some of the cheapest commercial styles use variety meats stuffed in inedible plastic casing to resemble sausage links. Before consumption, the casing is usually cut open and the sausage is fried in a pan and mashed with a fork until it resembles finely minced ground beef. A common alternative recipe does not have casings. Pork and beef are cured overnight in vinegar and chili powder. Served for breakfast, lunch, or dinner, it has the finely minced texture mentioned above, and is quite intense in flavor. In Mexico, restaurants and food stands make tacos, queso fundido (or choriqueso), burritos, and tortas with cooked chorizo, and it is also a popular pizza topping. Chorizo con huevos is a popular breakfast dish in Mexico and areas of the United States with Mexican populations. It is made by mixing fried chorizo with scrambled eggs. Chorizo con huevos is often used in breakfast burritos, tacos, and taquitos. Another popular Mexican recipe is fried chorizo combined with pinto or black refried beans. This combination is often used in tortas as a spread, or as a side dish where plain refried beans would normally be served. In Mexico, chorizo is also used to make the popular appetizer chorizo con queso (or choriqueso), which is small pieces of chorizo served in or on melted cheese, and eaten with small corn tortillas. In heavily Mexican parts of the United States, a popular filling for breakfast tacos is chorizo con papas, or diced potatoes sautéed until soft with chorizo mixed in. In Puerto Rico, Panama, and the Dominican Republic, chorizo and longaniza are considered two separate portions of meat. Puerto Rican chorizo is a smoked, well-seasoned sausage nearly identical to the smoked versions in Spain. Puerto Rican and Dominican longanizas have a very different taste and appearance. The seasoned meat is stuffed into a pork casing and is formed very long by hand. It is then hung to air-dry. Longaniza can then be fried in oil or cooked with rice or beans. It is eaten with many different dishes. Chorizo is a popular pizza topping in Puerto Rico. Salvadorean chorizo is short, fresh (not dried) and tied in twins. In Ecuador, many types of sausage have been directly adopted from European or North American cuisine. All sorts of salami, either raw or smoked, are just known as salami. Most commonly known are sorts from Spanish chorizo, Italian pepperoni, and wiener sausages; wieners are the most popular. Some local specialities include morcilla, longaniza, and chorizo. Morcilla, as in most Spanish-speaking countries, is basically cooked pork blood encased in pork intestine casing (black pudding in English). Longaniza is a thin sausage containing almost any mixture of meat, fat, or even cartilage, smoked rather than fresh. Chorizo is a mixture of chopped pork meat, pork fat, salt, whole pepper grains, cinnamon, achiote, and other spices, which produce its characteristic deep red color. A traditional dish consists of fried egg, mashed potatoes, avocado, salad, and slices of fried chorizo. In Argentina, Uruguay, Bolivia, Peru, Colombia and Venezuela, chorizo is the name for any coarse meat sausage. Spanish-style chorizo is also available, and is distinguished by the name "chorizo español" (Spanish chorizo). 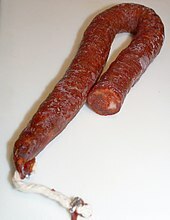 Argentine chorizos are normally made of pork, and are not spicy hot. 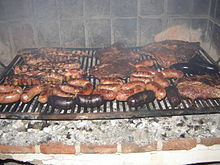 Some Argentine chorizos include other types of meat, typically beef. In Argentina, Bolivia, Paraguay, Uruguay, Chile, and Peru, fresh chorizo, cooked and served in a bread roll, is called a choripán. In Colombia, chorizo is usually accompanied by arepa. In Brazil, chouriço is the word used for what in the rest of Latin America is morcilla; meat sausages similar to the chorizos of other Latin American countries are called linguiça. Many varieties of Portuguese-style chouriço and linguiça are used in many different types of dishes, such as feijoada. In Bolivia, chorizos are made of pork, fried and served with salad (tomato, lettuce, onion, boiled carrots and quirquiña), mote, and a slice of bread soaked with chorizo fat. Chorizo sandwiches, without mote, are also eaten. Chouriço is made in East Timor. It was introduced by the Portuguese, with their colonization of East Timor. Goan sausages being sold at the Mapusa market, Goa, India. In Goa, India, which was ruled by the Portuguese for 450 years and has a large percentage of Goan Catholics, chouriço is made from pork marinaded in a mixture of vinegar, red chilies, and spices such as garlic, ginger, cumin, turmeric, cloves, pepper, and cinnamon, which is stuffed into casings. These are enjoyed either with the local Goan Portuguese-style crusty bread, or pearl onions, or both. They are also used, cut into chunks, as the meat ingredient in rice pilaf. They can be raw (wet), smoked or cured through salting and air-drying. Three kinds of chouriço are found in Goa: dry, wet, and skin. Dry chouriço is aged in the sun for long periods (three months or more). Wet chouriço has been aged for about a month or less. Skin chouriço, also aged, is rare and difficult to find. It consists primarily of minced pork skin along with some of its subcutaneous fat. All three chouriços are made in variations such as hot, medium, and mild. Other variations exist, depending on the size of the links, which range from 1 in (smallest) to 6 in. Typically, the wet varieties tend to be longer than the dry ones. Goan chorizo should be distinguished from "Goan frankfurters", which look similar to equivalents in the United States, but with a predominantly peppercorn flavor. Longaniza (Tagalog: longganisa; Visayan: chorizo, choriso, soriso) are Philippine chorizos flavored with indigenous spices, and may be made of chicken, beef, or even tuna. While the term longaniza refers to fresh sausages, it is also used in the Philippines to refer to cured sausages. Philippine longganisa are often dyed red with achuete seeds. There are dozens of variants from various regions in the Philippines. Creole and Cajun cuisine both feature a variant of chorizo called chaurice, which is frequently used in the Creole dish of red beans and rice. ^ Tara Morgan (15 June 2015). 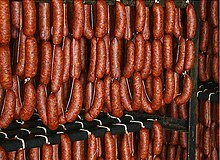 "From Choricero to Chorizo: The Rare Pepper that Makes Traditional Basque Sausage Sing | Edible Idaho". Edibleidaho.ediblefeast.com. Retrieved 18 November 2016. ^ Predika, Jerry (1983). The Sausage-making Cookbook. Harrisburg, PA: Stackpole Books. p. 32. ISBN 978-0-8117-1693-2. ^ "Dictionnaire Latin Français". S.A.R.L. idéMobi. Archived from the original on 13 November 2013. Retrieved 28 November 2016. ^ "Chorizo | Definition of Chorizo by Merriam-Webster". Merriam-webster.com. Retrieved 18 November 2016. ^ Trutter, Marion (2010). Culinaria Spain. Hf Ullmann. p. 343. ISBN 084167227X. ^ Aris, Pepita (2003). Spanish: over 150 mouthwatering step-by-step recipes. London: Hermes House. pp. 54–55. ISBN 0681304006. ^ "A Guide to Portugal's Different Sausages". ^ "CultureShock! Portugal: A Survival Guide to Customs and Etiquette". ^ "How to Make Feijoada, Brazil's National Dish, Including a Recipe From Emeril Lagasse". ^ "Chouriço à Bombeiro (Flame Grilled Chouriço)". Easyportugueserecipes.com. 11 August 2015. Retrieved 11 October 2016. ^ "Lusito Land Festival announces mouth-wateringly blissful menus". ^ "Chorizo Recipes for the Spice Lover in All of Us". Lets-make-sausage.com. Retrieved 11 October 2016. 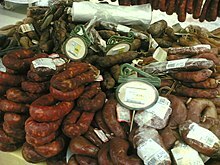 Wikimedia Commons has media related to Chorizo. Look up chorizo in Wiktionary, the free dictionary.